The Dolnji Hajduki household at Zilje 25 is the original Hajduk household in Zilje. The Gornji Hajduki and Hajduki iz brda are offshoots from this household. The surname of this family has likely always been Balkovec, and in records before 1820, individuals from this family sometimes have surnames recorded as Hajduk. The current house was built after the previous burned down in 1925 (along with the Oficiri house next door), killing many of the young inhabitants. 1A. Matija Balkovec b. 1777. At this time, it is unknown what happened to him afterwards. 1B. Marija Balkovec b. 1780. At this time, it is unknown what happened to her afterwards. 1C. Nikolaj Balkovec b. 1784, m. 1803 to Katarina Žalec (Žalčeva)1 — they remained at this house. 1D. Miha Balkovec b. 1787, m. 1811 to Barbara Žalec (Žalčeva)1 — they remained at this house. 1. Katarina Žalec and Barbara Žalec were sisters. 2A. Johan Balkovec b. 1806, m. 1838 to Ana Balkovec (Škrpelska) — they remained at this house. 2B. Marija Balkovec b. 1809, m. 1838 to Marko Čadonič (Lanarkin). 2C. Nikolaj Balkovec b. 1812, m. ca. 1844 to Marija Gorše (Zapojčeva from Hrast) — they remained at this house. 2D. Matija Balkovec b. 1814, died at the age of 56. At this time, it is unknown if he was ever married or had children. 2E. Janko Balkovec b. 1821, died at the age of 43. At this time, it is unknown if he was ever married or had children. 2F. Ana Balkovec b. 1824, m. 1857 to Mavar Frankovič (Dugače 9). 2G. Jože Balkovec b. 1925. At this time, it is unknown what happened to him afterwards. 2H. Katarina Balkovec b. 1814, m. 1839 to Matija Brožič (Dolnji Brožičev). 2I. Matija Balkovec b. 1827, died at the age of 31. At this time, it is unknown if he was ever married or had children. 2J. Jože Balkovec b. 1832, m. 1876 to Magdalena Žalec (Brdarova) — they lived at Zilje 45. 3A. Marija Balkovec b. 1840, died at the age of 32. At this time, it is unknown if she was ever married or had children. 3B. Barbara Balkovec b. 1843, m. 1869 to Jurij Balkovec (Gornji Baljkovski from Balkovci) — they remained at this house. 3C. Jurij Balkovec b. 1850, m. 1875 to Helena Čadonič (Gornja Krčmarova) — they remained at this house. 3D. Marija Balkovec b. 1845, m. 1866 to Miha Žunič (Bacinov from Žuniči) — they lived at Zilje 42. 3E. Ana Balkovec b. 1848, m. 1873 to a man from Prilišće 46. 3F. Katarina Balkovec b. 1852, m. 1879 to Franc Domitrović (Milani 8). 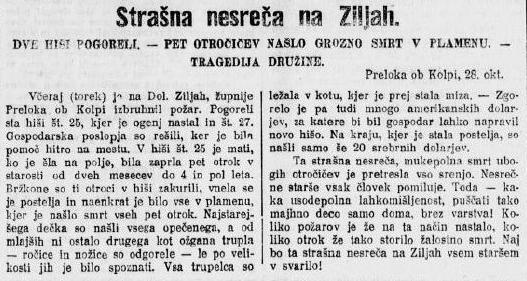 At this time, Nikolaj Balkovec [2C] and his wife Marija Gorše built Zilje 42 and moved there.. They became known as the Hrastovkini. 4A. Jurij Balkovec b. 1870 in Ogulin. At this time, it is unknown what happened to him afterwards. 4B. Jože Balkovec b. 1872, m. 1902 to Katarina Brožič (Brožičeva from Golek). 4C. Marko Balkovec b. 1876. At this time, it is unknown what happened to him afterwards. 4C. Marko Balkovec b. 1877, m. 1903 to Marija Žalec (Mikolina) — they remained at this house. 4D. Jože Balkovec b. 1883, died at the age of 22 in Pittsburgh, Pennsylvania. At this time, it is unknown if he was ever married or had children. 4E. Peter Balkovec b. 1885, m. 1908 to a woman from Prilišće. 4F. Franc Balkovec b. 1888, died at the age of 39 in Montana. At this time, it is unknown if he was ever married or had children. 4G. Nikolaj Balkovec b. 1892, died at the age of 80 in Montana. At this time, it is unknown if he was ever married or had children. 5A. Janko Balkovec b. 1905, died at the age of 33 in Ontario, Canada. A fire burned down the Hajduki house in 1925 and killed most of the remaining children.